Well, last night the 12V cable of my part cooling fan came loose on the soldering point inside of the fan (a crappy chinese 50mm radial fan used by thousands I presume) and of course with my bad luck caused a short with the very close ground soldering point. Immediately some parts on my brand new Duet Wifi started to produce blue smoke. Thank god I saw pretty quickly, that smoke evolved just near the FAN0 plug and cut the power to the board immediately. After the cool down I looked at the mess and I became very sad, since some parts are definately fried. And since the fried parts are near the FAN0 outlet, I suspected the FAN wiring and since my own wiring was good, I opened the fan and saw the loose cable and the short on the small PCB of the fan. The board is still working so far, but FAN0 of course does not work anymore, when I issue commands like M106 P0 S1 it returns M106 P0 S0.34. Thankfully FAN1 and FAN2 are still working and so does the rest of the board, the catastrophy is not that big. Still I would like to know, if there is something I can do to fix the board / FAN0. I am not a total amateur in SMD soldering, but of course I have no clue, what parts to replace or should I rather send the board for repair?`As said, the board is brand new, but of course I am aware, that this is not covered by the warranty, but I am angry, that that crappy fan had to blow right after a couple of hours of happy printing . Anyway it would be very nice if someone could help me out here or give me a hint what to do best. Edit: Ouch, just looked at your pic. You definitely got worse than I did out of it. Might be more than just the mosfet? 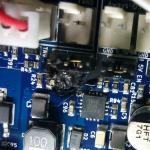 The image is not clear enough for me to see what else may be burned, but it's probably that mosfet and possibly some of the PCB traces connecting to it. OK, thanks, here are 2 better pictures I hope. Maybe now you can tell me, what to do with the board? It looks as though the traces that the mosfet was soldered to have burned and lifted, which will make replacement more difficult. Alright, just curious, how is it possible, that the short of the fan can cause such big damage to the board, even though the wiki says literally "If you short out a PWM fan, the fan driver mosfet will burn out", but this means actually that can damage a lot more…. Dont get me wrong here, I am not blaming the board, it was clearly the fan short, but as an educated electrician I am interested to learn, how that short could cause that much damage. In the meantime, I will try to get that mosfet and then start cleaning up. Oh and can you please direct me to an image, how the board is SUPPOSED to look at that area, so I can learn how to repair it? Thanks, I already started to clean up exactly with a toothbrush. so looks as if only TR5 is destroyed. So I will try my very best. I'm in the process of converting my Ormerod 2 to a core x-y D-Bot and was just thinking about attempting to protect against failures like this by bouncing the connectors on the duet through a break out/fuse board. Would a poly fuse or quick blow standard fuse respond quick enough to protect the Duet? With the exception of the steppers anything that shares the main voltage would cause serious damage if shorted to earth before the load? Currently I'd be thinking about protecting the fan and heater outputs. I didn't think it'd be worth protecting the steppers as there would have to be a failure of the control circuit to dump more than 2A to the drives anyway? It seems to be fan connectors that users short out. One way to protect them would be to remove the fan voltage select jumper and connect a fuse between the centre pin of that connector and +VIN, assuming you want the fan voltage to be the same as VIn. What would be an appropriate fuse amperage for 24VIN that would protect the mosfets? This sounds like a prudent addition given that I may be changing between effectors on a frequent basis, and have quick disconnects on the cooling fans. If they are ordinary 24V brushless fans, they will take roughly 150mA each. So a fuse in the range 500mA to 1A should be about right, depending on the number of fans. Thats a simple way to solve the problem. Will Make me a wire with fuse holder and do it like that. Cheap insurance. "A transistor always protects any fuse" (C) "Arts of electronics"
Addition: Without some sort of current limitter in MOSFET switch it is no chance for the fuse to work, IMHO. Ohh, I like that elegant solution! As the post prior to yours points out, it's quite possible that the mosfet will fail before the fuse blows; but if it fails short circuit, then at least the fuse should protect the PCB traces. On a very similar subject I've noticed reverse connected diodes on the fan controller (between V_IN and FanX-) on the DuetWifi, but not on the Duet 0.6. Are these intended as flyback diodes to catch the inductive kick from the fans when the supply voltage is chopped? If so is it advisable to add reverse connected diodes to the fans connected to Fan0 to protect the Duet 0.6? We added the flyback diodes in PCB revision 1.02 because a few users had connected BerdAir or similar water pumps to fan outputs without using a flyback diode, which damaged the mosfet. Ordinary brushless fans do not require flyback diodes, but brushed DC motors do.